Jeremy Katz of Brooklyn, New York, was rated 2256 in USCF postal at the time of this game. I was often listed among the top APCT players 20-30 years ago, played Board 4 for the Xth World Correspondence Chess Olympiade 1982-84 US team, was a USCF Postal Master off and on in 1990, and won an ICCF Master Class section 1995-97. I tend to play chess more by instinct and pattern recognition than by analysis. Of course, often in my correspondence play, like in the game below, I had to make very specific calculations. 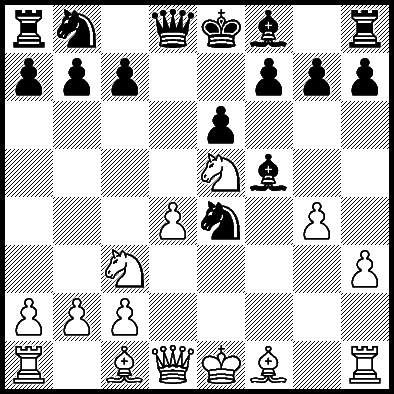 Against the French Defence, White can choose from several good third moves. Below is a beautiful little game played in BDG style. Some come to the BDG after years of playing against the French after 1.e4 and feel comfortable with whatever they have been playing. I played all four common responses, 3.Nc3, 3.Nd2, 3.e5 and 3.exd5, as well as the offbeat and risky 3.Be3!? Alapin French. My performance with 3.Be3 has been slightly higher. The Alapin-Diemer may not be sound, but it can be very dangerous for Black. Bill Wall's 500 French Miniatures gives 16 games (and others that would transpose); White scored 16-0. 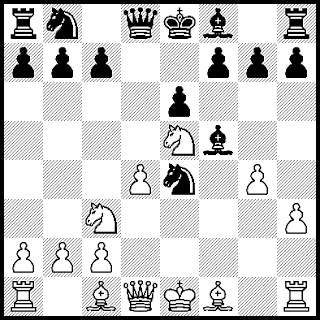 In 1995 my book on the variation called the "Alapin French, Tactics for White" was published. In the introduction to that book, I wrote: "Welcome to the King's Gambit of the French Defense! White gets quick slashing attacks that often win in 20 moves. John Watson cites my book in his 1996 edition of "Play the French". Watson gave about one half of a page to the Alapin with variations that go beyond move eight in only a few cases. Eric Schiller recommended the Alapin as the gambit to play vs the French Defense in his book "Gambit Opening Repertoire For White". Chess opening repertoire books present a plan for you to follow a set of similar ideas at the beginning of a game. I played a game where the line in a book for White intersected the line given in a book for Black. The two authors had differing views of how to handle the Petroff Defence Kaufmann Attack developed over 100 years ago by Dr. Arthur Kaufmann. Larry Kaufman in his classic book "The Chess Advantage in Black and White" calls the Petroff by its other common name the Russian Defense. Larry Kaufman follows 5.c4 idea of the Kaufmann with the extra "n" by giving 10 pages of games and analysis for White including this quote: "Some of the lines are a bit drawish, but I'm afraid that is unavoidable when dealing with the Petroff. All we can ask for is a position where most of the winning chances are on the White side, and I believe the Kaufmann Attack fits that description." For Black, I chose the 2011 book "The Petroff: an Expert Repertoire for Black" by Konstantin Sakaev, whose comment on 5.c4 is: "This is an original move, but that's about the most positive thing that can be said about it." After 5...Nc6 6.Nc3 Nxc3 7.dxc3 both writers mention the typical 7...Be7, but the line reminds me of the popular 5.Nc3 Nxc3 6.dxc3 Be7 line and the Alekhine Defence Exchange Variation 1.e4 Nf6 2.e5 Nd5 3.d4 d6 4.c4 Nb6 5.exd6 exd6 6.Nc3 Be7. These lines tend to be solid but potentially passive. Our authors mention the development of the Black's light squared bishop with 7...Bf5 (Sakaev) or 7...Bg4 (Kaufman). In general after 5.c4 Nc6, Larry Kaufman considers the dynamic approach of castling opposite sides as a good idea to play for a win: 0-0-0 vs 0-0. Konstantin Sakaev's improvement is 7...g6, where he considers only 8.Be2 and 8.Bd3. My opponent below played something logical but new to me: 8.0-0. We reached a bishop vs knight endgame where the White king had no entries points to invade the Black defenses. "on 10 October the well-known Baden chess theoretician and tournament player, Emil Josef Diemer, died n south Baden Fussbach at the age of 82. ...born on 15 May 1908 in Bad Radolfzell ... work best known to many gambit friends... contributed authoritatively through his exploration of the Blackmar-Diemer Gambit." "In Emil Josef Diemer one of the last 'chess originals' left us. In chess generally and in gambit play especially, to which he dedicated his entire life, his ardent, shining life was fulfilled." Here is the last known game Emil Josef Diemer played the BDG Ryder Gambit. Most greedy computers back then did not analyze deep enough to consistently defeat masters. Some theory today. If in the Blackmar-Diemer Gambit Teichmann 5.Nxf3 Bg4 we see the unusual retreat 6.h3 Bf5, it becomes in effect a Gunderam 5.Nxf3 Bf5 with an extra h2-h3 move for White. All this is moot after 7.Ne5 e6 8.g4 if Black plays the solid 8...Bg6. Then 9.Bg2 c6 10.h4 reaches an important position that can come from either a Teichmann or a Gunderam (in one less move). Here White has full compensation for the pawn. Ken Wieder in the Finals of the USCF 1989 Golden Squires Postal Chess Tournament decided to play much sharper with 8...Ne4!? In this BDG Teichmann, fireworks ensued. The line in the notes with 9.gxf5 demonstrates a key difference between the 8...Ne4 Teichmann and the 7...Ne4 Gunderam. The White h-pawn being on h3 instead of h2 allows two queen checks that prepare two knight forks, leading to a very difficult endgame. I chose another complicated line and won quickly when Black missed a tactic. Recently I bought a new book by James Schuyler entitled "The Dark Knight System: a repertoire with 1...Nc6", published by Everyman Chess in 2013. That is a nice descriptive title for a major branch of the Queen's Knight Defence. This book interested me greatly since I have played 1...Nc6 as Black vs everything a total of about 3000 times (counting both blitz and tournament games). And, we all have to face 1...Nc6 when we play White. Who is this chess author? Page 3 has this note About the Author: "James Schuyler is a FIDE Master. He was Nevada State Champion in 2007 and won the Virginia State Championship in both 2011 and 2012. He has been teaching chess for over 25 years." The Dark Knight System teaches how to play a well-coordinated method of development as Black that helps you to win future chess games. Why call it "Dark" Knight? We begin with the Black horse that starts on a dark square. 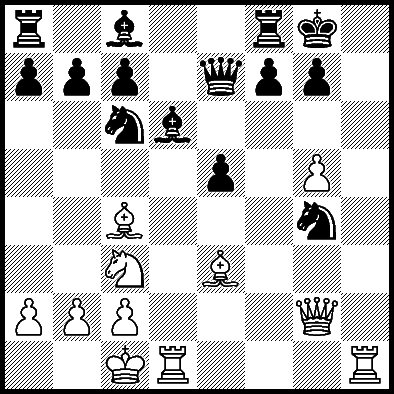 From 1...Nc6, this knight hits important dark squares, often preparing ...e5. The knight works in conjunction with the dark squared bishop. Starting from Bf8, the author has this bishop going to Bb4, Bc5, Bd6, Be7, Bg7 or even Bh6 (all depending on what White does). Everything in the book is helpful. Schuyler's concepts are understandable. After a lengthy introduction, there are 10 chapters with specific theory. There are just over 50 branches of analysis going about 10 moves deeper. 500 positions are manageable if you plan to master the main lines to an expert level. Or on an easier practical level, you can play games with 1...Nc6, and look up the recommendations afterward. Starting on page 134 are 100 annotated games, illustrating how to go from the opening to the finish. I highly recommend the book. This system is less popular, but many grandmasters play it, so we know it is sound. The benefits are real. Houdini supports all the analysis. The only minor problem I found was a bold headline before Game 22 on page 152 that reads "No problems for Black after 3...Bb4+ 4.Bd2", with which I agree. But it is placed on a page where the games had 4.Nd2 instead. No big deal. A minor editorial glitch. If you are looking for a new opening as Black, this book provides a good option.